Why would someone want to learn about color temperature? Because knowing how color temperature affects the output hue is a key element in designing light sources with LEDs. Binary colors such as Red, Green, and Blue are expressed in wavelengths as nanometers. White colors are expressed in temperatures. Color temperature is a method of describing and measuring the color characteristics of light. 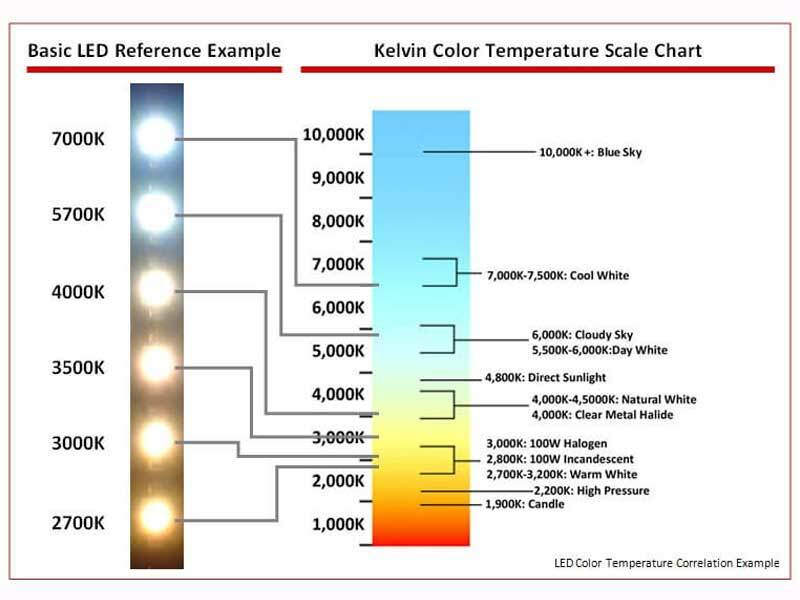 The scale used is the Kelvin Color Temperature Scale, which was named after William Lord Kelvin of Ireland, who wrote of the need for an “absolute thermometric scale” of temperatures. Temperatures in Kelvin are not referred to nor expressed as degrees, such as in the Fahrenheit or Celsius scales. The definition implies that absolute zero (0 K) is equivalent to -273.15⁰C, or -449.67⁰F. Color temperature is based upon the principle of the black body radiator; this black body will emit light whose color depends upon the temperature of the radiator. As an object is heated, it will begin to glow, and the color will move from deep reds (such as seen in a wood fire), through oranges and yellows, all the way to white hot. Light sources that glow this way are called incandescent radiators, and the advantage to them is that they emit a continuous spectrum, radiating light energy at all wavelengths of their spectrum. Because the spectrum of light is wider than our ability to see it, values falling below the visible part of the spectrum are referred to as infrared, and values above the spectrum are ultraviolet. Light emitting diodes are not incandescent radiators because each color die emits light at a slightly different band. These types of radiators have what is referred to as a Correlated Color Temperature (CCT), which is an indicator of their ability to render all colors of their spectrum. While the theoretical black body radiator has a CCT of 100, LED’s approach this with a 70-90+ rating. There are variations on this standard, but this is a good start to understanding the relationship between color temperature and color hue. It is important to keep in mind that lower temperature reds are considered to be “warm” while higher temperature blues are described as “cool”. In this instance, the warmer and cooler refer to the hue, not the temperature. Pixent LEDs are offered in three temperatures of white: Blue White (5700-7500 K), Natural White (3800-4500 K), and Warm White (2700-3200 K). The ranges here represent the entire range of temperature output from any particular die series; in the factory the dies are ‘binned’, or selected; to be within 200-300 K of each other on any particular lot of parts. Thus any order of LEDs will be only of a single bin, keeping the light temperature very consistent across their design life, and can be depended upon to do so. There is some drift that correlates with the temperature of the LED, but it is generally very linear within a single bin. But what if we want to create differing temperatures of white at different times with the same LED? To do this, we use the RGB LED and vary the grayscale intensity of each of the three dies to produce a emitted light product which is the particular hue of white we want to achieve. Using the Pixent led-exec software and the PixelDrive board, a desired hue can be designed and implemented very simply. Because the entire string of LEDs will display the hue being selected, the decision on hue can be made in real time and under real conditions. Below is an example of how the color selection slider can be used to create a hue with RGB LEDs. Pixent is a developer and manufacturer of LED Controllers and Intelligent LED products. Our state-of-the-art automated production lines provide the most cost effective products in the decorative lighting market. Pixent LEDs are available in a variety of colors, sizes, voltages; and in both programmable and non-programmable configurations. We provide discrete LEDs so that you can design your own boards and products, and also provide pre-made flexible strips and standard rigid PCBAs. We also can provide custom designs tailored to fit your needs. 1. For the purposes of this Agreement, "Confidential Information" shall mean any information disclosed by Pixent and/or Summitech LLC, whether in writing, orally, visually or otherwise, including but not limited to customer lists, supplier lists, manufacturer lists, business plans, contractual, engineering, financial, sales, marketing and operational information, product specifications, technical data, trade secrets, know-how, ideas and concepts of Pixent and/or Summitech LLC or third parties. Confidential Information excludes, however, information which: (i) is or becomes known or available to Recipient without restriction from a source other than Pixent and/or Summitech LLC with a legal right to disclose the same to Recipient; (ii) is, or without violating the terms of this Agreement becomes, generally available to the public; or (iii) is developed by Recipient independently of the information disclosed hereunder. b. disclose the Confidential Information to any third party except: (i) for directors, officers, managers, employees, consultants, contractors and professional advisors of Recipient (collectively its "Representatives") who need to know the Confidential Information for the Authorized Purpose and who are subject to an existing obligation to, or enter into an agreement with, Recipient not to disclose Confidential Information; and (ii) as may be authorized in writing in advance by an officer of Pixent and/or Summitech LLC. 3. Recipient shall require its Representatives who receive any Confidential Information to comply with the terms and conditions of this Agreement and Recipient shall be responsible for their compliance herewith. Recipient shall use at least the same degree of care to protect the confidentiality and ensure the proper use of the Confidential Information as Recipient uses with respect to its information of a similar kind or nature, but in no event less than reasonable care. 4. Pixent and/or Summitech LLC grants no rights in or to the Confidential Information. All Confidential Information shall remain the sole property of Pixent and/or Summitech LLC. 5. No contract or agreement providing for any transaction or any commitment to enter into a transaction shall be deemed to exist by reason of this Agreement. 6. Any provision to the contrary notwithstanding, Recipient's obligations under this Agreement are subject to any disclosure requirement of law, regulation or legal process, but only to the extent of such requirement. Recipient shall promptly notify Pixent and/or Summitech LLC of any such requirement, cooperate fully with Pixent and/or Summitech LLC's requests to prevent or minimize the effect of such disclosure, and make all reasonable efforts to have such disclosures placed under a protective order or otherwise obtain confidential treatment of the Confidential Information. 7. THE CONFIDENTIAL INFORMATION IS DISCLOSED "AS IS" WITHOUT ANY REPRESENTATION, WARRANTY, ASSURANCE, GUARANTEE, OR INDUCEMENT OF ANY KIND, INCLUDING WITHOUT LIMITATION ANY EXPRESS OR IMPLIED WARRANTY OF COMPLETENESS, ACCURACY, MERCHANTABILITY, SUITABILITY, NON-INFRINGEMENT OR FITNESS FOR PURPOSE. 8. Upon Pixent and/or Summitech LLC's written request, Recipient shall promptly: (i) deliver to Pixent and/or Summitech LLC and cease to use all Confidential Information in Recipient's (including its Representatives') possession, custody or control; or (ii) destroy the same and delete all electronic records containing the Confidential Information, provided that Pixent and/or Summitech LLC may require Recipient to certify in writing such destruction and deletion. 9. Recipient agrees that money damages would not be a sufficient remedy for breach of this Agreement and that, in addition to all other remedies, Pixent and/or Summitech LLC shall be entitled to specific performance and injunctive or other equitable relief as a remedy for such breach. 10. This Agreement sets forth the complete and exclusive statement of the parties' agreement with respect to the subject matter hereof. This Agreement may not be waived or modified except pursuant to a written agreement signed by the parties. Any waiver or forbearance on one occasion shall have no effect on any other occasion. 11. Any provision hereof which is found to be unenforceable or contrary to applicable law shall be deemed stricken from this Agreement and the other terms and conditions hereof shall remain in full force and effect. 12. This Agreement shall bind and benefit the parties and their respective successors and assigns. Recipient's obligations under this Agreement shall survive any termination hereof. 13. If any legal action, arbitration or other proceeding is brought for the enforcement of this agreement (including any cross-complaint, counterclaims, or third-party claim), or because of an alleged dispute, breach, default or misrepresentation in connection with any of the provisions of this agreement, each party shall bear its own attorneys' fees. 14. Each party to this Agreement represents that such party has read and understood each provision of this Agreement and has discussed this Agreement with legal counsel or has been provided with the opportunity to discuss this Agreement with legal counsel, and the general rule that ambiguities shall be construed against the drafting party shall not apply in the interpretation of this Agreement. 15. This Agreement shall be governed by the laws of the State of Nevada, USA. The parties consent to the jurisdiction of the state and federal courts situated in Reno, Washoe County, Nevada, USA. The party receiving confidential information agrees to execute a written non-disclosure agreement incorporating the terms set forth above if requested by Pixent and/or Summitech LLC.